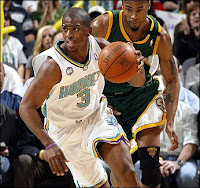 The New Orleans Hornets need to beat the San Antonio Spurs in game 7. If we strip the votes away from all the MVP voters and determine who the MVP is by playing a seven game Lakers v. Hornets Western Conference Final the NBA will benefit drastically. The truth is no one likes to watch the Spurs play, they are boring, methodical, and exhausting. The NBA faithful are dying for a Chris Paul v. Kobe Bryant seven game dog fight. The NBA's most dominant point guard v. the NBA's most dominant player. The likes of Tyson Chandler & David West banging with Pau Gasol and Lamar Odom, the city of New Orleans with a shot at a professional sports title, what is not to love? The Hornets need to upset the Spurs and make their run at L.A.
Who needs road wins? We are fans at heart right? We love game 7 don't we? So with that said, I don't care if another road team wins a playoff game (if that happened the Celtics would win the NBA Championship, Boo-Yah) Jeff Van Gundy said it best, "we're not really sure why the thunder sticks on the road aren't as loud as they are at home" The fact is teams are just playing looser at home, they feel as though there isn't any pressure on them and in large part your running into teams whose playoff life is on the line if they lose just one. The Magic dropped the 1 home game of the NBA Playoffs second round (home teams are 19-1) and they are the only team to go home thus far. If your down 2-0 you can't go down 3-0 and if your down 3-2 you can't get knocked out, the home team does nothing special they just play alot harder. Case & Point: Game 5 Celtics v. Cavs, Lebron opens up with 23 points and a 14 point lead until the 3rd quarter when Boston puts the clamps on and takes care of business. That's why we play 82 games, to see who gets home court advantage. Detroit is finally awake An unknown amount of preseason games, 82 regular season games, the first two rounds of the playoffs, and the Detroit Pistons have finally woken up. After slapping Philly back to reality then quickly dismantling Stan Van's Magic, the Detroit Pistons are a Chauncey Billups injury away from being well oiled for their Eastern Conference championship series, which in Detroit has become a staple. The most errrrr unique? player in the NBA, Rasheed Wallace, is laying in the grass waiting to play the Celts. Is their any team in the NBA who has been more underachieving than the Detroit Pistons? If the Pistons put another notch on their dominant Eastern Conference run, it'll be in 2008. 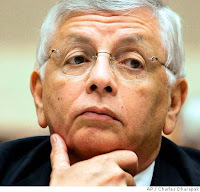 Quick Needed Note: As much as I love the NBA and the playoffs, this post was supposed to be published yesterday, however it didn't make it out and since then the refs & David Stern have forced a Game 7 in Boston and put the Lakers one step closer to the championship. SHOCKER! (sense the sarcasm) While some of my NBA loving friends refuse to believe that the NBA or professional sports for that matter, are in any way fixed, I am not that naive. If any outcome of any sport could be fixed, it's hoops. Refs can control momentum, who stays in the game, and even score. (If you buy that point shaving does take place) I still love basketball despite this, but I'm not going to ignore that from church league basketball all the way to the pros no ref can accurately tell the difference between charging and blocking. Thanks Jon . . .
South of the Border No Mas!